I recently purchased this green Hemingray 19 and I cannot identify the color. I purchased it as a 7-up green but, after comparing it to my others, I don't think that is the correct color description. I placed it next to two Hemingray 19s that are true 7-up green and it looks different. The one I am trying to identify is the one in the middle of the three insulators in the pictures. 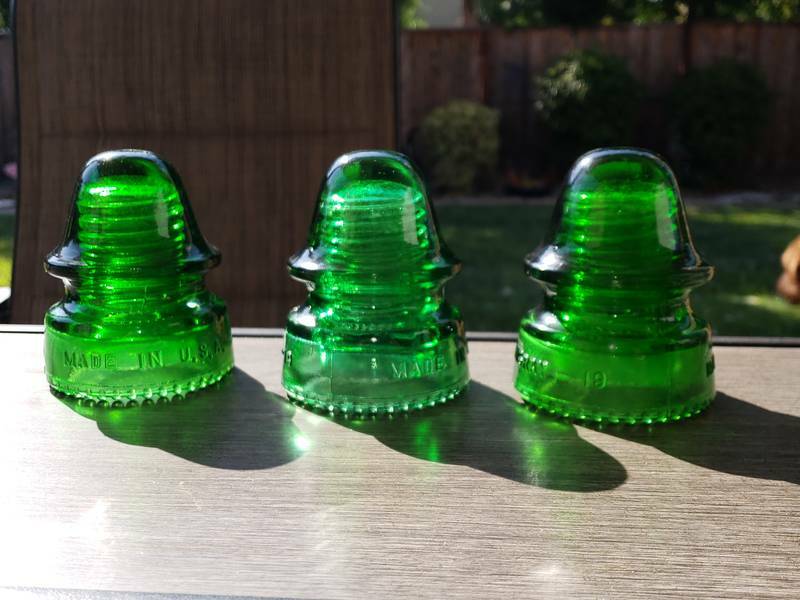 As many of you have seen more insulators than I have, I thought someone might have an idea about it. I have had one other collector suggest it is a light 7-up green. Any other ideas? Thank you for your help. Thanks to everyone that answered. The consensus is that it is a 7-up green but a light shade of it.